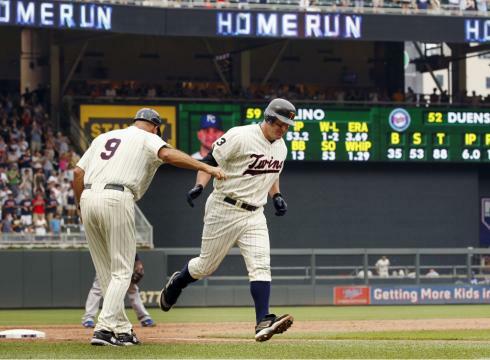 Thome, who hit his 599th home run the previous inning off of starter Rick Porcello, took a 2-1 pitch 360 feet to left field, landing in the Tigers' bullpen. He is the eighth player in major league history to hit 600 career home runs. "It's an unbelievable night, obviously," said a champagne-drenched Thome. "I think it's something you never dream of doing. You dream about it, but when it finally happens, it's kind of surreal. It's a neat thing, it really is." When No. 600 went over the fence, the history-loving crowd in Detroit came to its feet to applaud the man, if not the effect on the box score. They realized that Thome had achieved an amazing feat in hitting #600…one that only eight hitters out of the estimated 17,000 men who have played the game since its inception have ever achieved. Only seven sluggers have hit more homers than the Paul Bunyon-esque Thome: Barry Bonds, Hank Aaron, Babe Ruth, Willie Mays, Ken Griffey Jr., Alex Rodriguez and Sammy Sosa. A-Rod, who joined the 600-homer club last August, needed two weeks to hit No. 600 after reaching 599 last year. Thome waited one inning. Only Babe Ruth needed fewer at-bats to reach 600, doing so in 6,921. Thome's milestone came in No. 8,167. 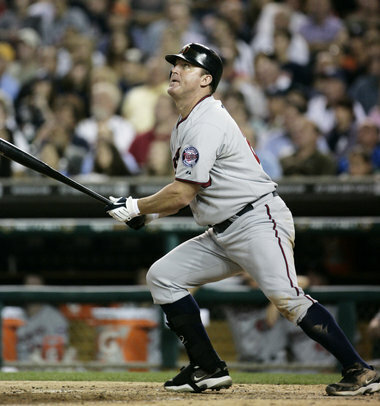 When Jim Thome hit his 500th Home Run for the Chicago White Sox on September 16, 2007, some baseball pundits predicted that the Peoria, IL-born slugger had reached the pinnacle of his career, and would soon be headed back to the cornfields and deer hunting grounds that he emerged from 37 years earlier. But “The Thomenator” has proved his critics wrong and made his many fans (especially in Chicago and Minnesota) stand up and cheer 100 more times (and counting). An all around great hitter, Thome has made a 19-year career out of being one of the nicest guys in the clubhouse and among the smartest at the plate as he continued his workman-like approach by getting clutch singles, doubles, (not quite as few triples) and homers when they counted most for the Twins, Dodgers, White Sox, Phillies, Indians (in reverse order). He's a career .277 hitter with a lifetime on-base percentage of .403. So he’s not a swing-for-the-bleachers-every-trip-to-the-plate kinda guy. And he’s not one to seek attention or pose in the media spotlight, much preferring to attribute his long and lustrous career to his teammates, coaches, wife/family and God-given talent (not necessarily in that order). So it’s no surprise that the Minnesota Twins are sticking with him for moments like the sixth inning on July 17th against the Royals when, with the game tied and his team in desperate need of a jolt, Thome clobbered one of his signature deep fly balls into the upper deck of right-center fie ld for his 596th home run – and in doing so lifting the Twins to a 4-3 victory before a small but boisterous Target Field crowd. Afterward Thome brushed off reporters’ questions about his pending 600 HR milestone in his characteristically nonchalant way saying "It's always special," Thome said. "That feeling you want to kind of last forever. It went out, it put us ahead. And that's No. 1." And while many feel Thome hasn’t received the recognition he deserves for a lifetime of stellar achievements on and off the field (see Jim Thome's Quest for 600) the big man himself is truly at piece with his life in and out of baseball. “My dad told me, 'It's not what you do when you walk in the door that matters. It's what you do when you walk out.' That's when you've made a lasting impression.” And Jim continues to make a lasting impression with every no-nonsense head down, I’m-just-doing-my-job trip around the bases. Pretty soon it will be his 600th and that will really be something to see.